Part of the fun of being in Punta Arenas is getting to Punta Arenas. From just about every way I looked at it, Chile is one of the most beautiful and varied landscapes in the world. High desert salt flats and rocky peaks lead southward into Santiago. We flew over the Atacama on our way from Lima to Buenos Aires and were stunned to see brightly colored mining ponds from the air. But to get from Santiago to Punta Arenas we flew almost straight down the Cordillera – mountains colored red, yellow, and orange by their mineral makeup, active volcanoes issuing wisps of smoke. As we neared the Puerto Montt and lake region the land became less dusty and sprouted trees and the mountains grew glaciers. Further on, great ice sheets took over, darker lines of crushed rock marking their inching currents. Finally, through the clouds, the southern straits and islands of Patagonia. Punta Arenas is the smallest city we’ve lived in during this trip, with a population of just over a hundred thousand people. Tourists often visit for just a day or two on their way to Antarctica or to Puerto Natales and Torres del Paine National Park. The town is friends and much less chaotic than most places we’ve been. Around our Airbnb, the nearest beach is dominated by a sunken ship, and the park has statues of extinct dinosaurs but also a live horse that roams the grounds. The most popular activity in town seems to be touring the Cervecería Austral, which claims to be the southernmost brewery in the world (though I can think of a couple smaller ones that might debate that point). As far as beer tours go, Austral’s was a good one. Our guide was kind enough to give his talk in both Spanish and English, even though we were the only non-Spanish speakers in the group. We saw their storage facilities, bottling line, and tanks that had active fermentation going on inside. And of course, we ended with a tasting consisting of five Austral Beers and two brewed for Imperial. Austral’s Calafate Ale was my favorite – the berries used to flavor it make it taste a little like candy. A few blocks away from the brewery is one of PA’s best views. It looks out over the Strait of Magellan and the town’s bright roofs. The “how far to?” signboard is here – most cities seem to have one hidden somewhere. There is an impressive amount of smaller towns, especially from Germany. It seems like anyone can add their own as long as they have a spare couple of nails. Nearer to the old center of town is the Museo de Magallanes. The rooms of the Palacio Braun Menendez have been kept/restored to their early twentieth century glory and some have been converted into displays presenting the region’s history. It’s free, so it was easy to stop in for a few minutes and avoid an impromptu rainshower. The first few rooms proved that wealth means comfort just about everywhere, even on the far corners of the continent. The family had imported hardwoods, gaming tables, sumptuous fabrics, and enough gorgeous inlay to rival grand homes in any capital. Some servants’ quarters in the basement are also kept in a near-original state, though they are obviously more spare. We are in Punta Arenas at the end of their summer (equivalent to mid-August to mid-September in the northern hemisphere), but that doesn’t stop the weather from feeling wintery. One of the first things I sought out was a jacket to layer under my raincoat. The wind off the Strait can be biting, and the sun stays hidden much of the time, making it even harder to warm up. And rain seems to be constantly threatening on the horizon. Thankfully, indoors there is a working heater and we can take the opportunity to cook heavier meals that summer doesn’t lend itself to. Anything for an excuse to mull wine and make a batch of poutine! 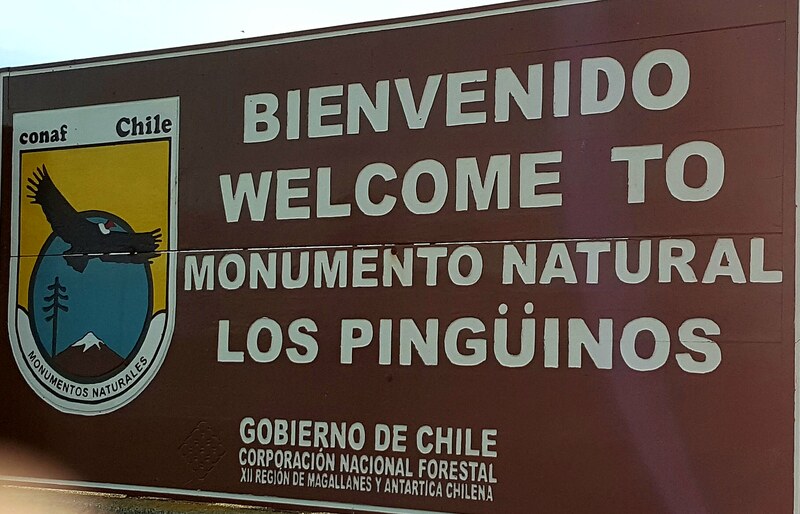 If you are going to spend time in Punta Arenas, penguins are usually high on the to-do list. There are a couple colonies nearby, but the best known is the Magellanic penguin colony on Isla Magdalena. We purchased tickets through the Comapa agency downtown; the other option was to buy them at the terminal. We had skipped the overpriced penguin tours on the cruise, and this was our chance to make up for it. The Melinka ferry leaves from the Tres Puentes terminal in the afternoons about 4 and arrives on the island about 6 pm. Buses or collectivos running directly to the terminal are rare, but just about all of them go to the nearby Zona Franca. From the duty free area, the terminal is just a fifteen minute walk away. Before arriving at Isla Magdalena instructions for behavior on the island are repeated four or five times in Spanish and English. They really want you to remember not to feed or touch the penguins or lay down on the path. But then we landed, the front of the ship was lowered, and the crowd was off. We visited in late February, when summer starts waning and the penguins molt. The chicks were already grown so we missed our chance to see youngsters. But there was no getting around it: the island was full of penguins. It doesn’t have much else to recommend it since all the grasses and vegetation have been plucked to line penguin burrows, leaving only bare windswept rock. It surprised me to learn that Magellanic penguins live in burrows while on land. They never struck me as digging animals, but apparently they do a pretty good job of it. At the other extreme, they also spend months also the also time in the ocean, swimming as far away as Brazil in search of meals. The one of the left is so embarrassed to be molting! The roped-off trail looped left, uphill toward the lighthouse, and then back towards the boat. Groups are only allowed to be on Isla Magdalena for an hour, and the length of the walk is timed to this. 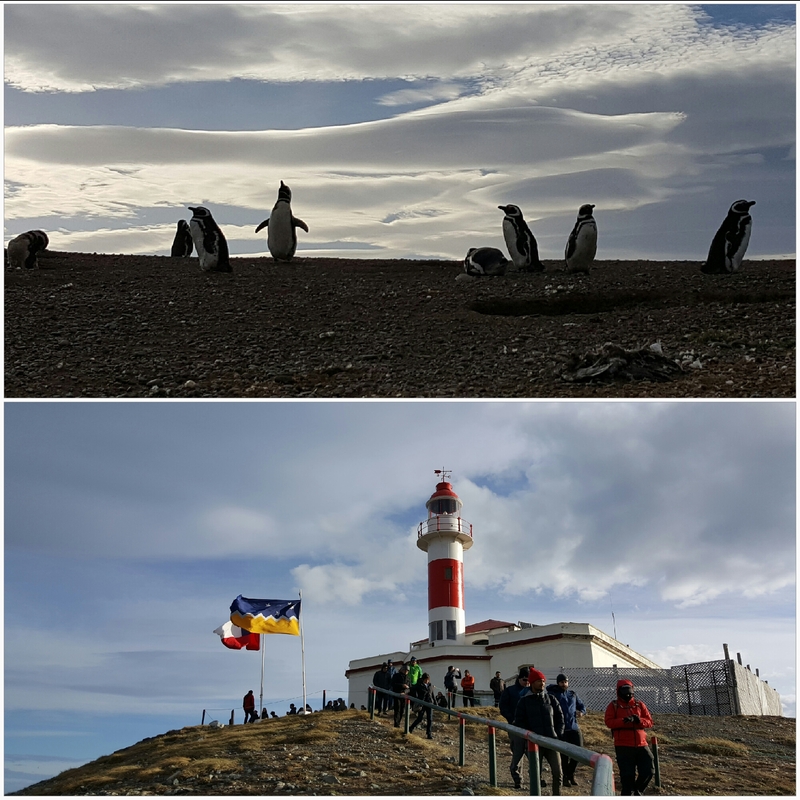 We took a few minutes to explore displays inside the lighthouse, but spent most of our time watching the penguins toodle awkwardly around on land. We had relatively nice weather, but it is always windy and often rainy on the strait. Layers went a long way to keeping us comfortable while we were there. Our ferry ride back seemed to pass more quickly, partly because dolphins were playing alongside the ship for a while. Getting back to the terminal at night makes flagging down collectivos more difficult and the buses had already stopped running. We waited a while but decided to take a metered taxi instead. The rate was many times higher than a collectivo would have been, but still less than $8 back to the far corner of town. Overall, Isla Magdalena was definitely worth the trip and the price. Seeing penguins in their natural habitat and completely unafraid and unworried by gawking humans is an experience I’d recommend to anyone. All the penguin movies don’t do the real thing justice. Santiago is a massive city – about 40% of Chileans live inside its metro area. It would be easy to get lost in any of dozens of neighborhoods, but we mostly focused on the places we could walk to from our apartment. There were more than enough museums, markets, and palaces to keep us occupied just in the central areas of town. As usual, the churches we stumbled across were mostly Catholic and always beautiful. The Virgin Mary is often the central focus, with shrines to other Virgins around the interior of the church. Unlike in Europe, where most saints are statues or paintings, here, the Marys are usually draped in sumptuous fabrics and laces. We made the little bit of extra effort to book a (free!) tour of the Palacio de la Moneda, Chile’s Presidential Palace. Upon arrival, we discovered we were the only ones signed up for English during that time slot, so our guide Carla gave us a private tour. The Palace originally served as a mint under the Spanish crown. In the mid-1800’s it started housing the Presidential residence and offices. It was here in 1973 that the democratically-elected Salvador Allende was overthrown (with help from the CIA) and the Pinochet regime installed. Military jets bombed the palace and destroyed much of the building. It has been rebuilt, but its gorgeous interiors were not restored to their previous glory. Currently it serves only as offices for the President and some of her ministers; Chilean Presidents are not given a government residence. We saw the courtyards, which are planted with orange trees and native plants, and which also house two cannons that used to guard the coast from pirates. The cannons’ names are Furious and Lightning – because naturally cannons work better when they know they are loved. Inside, we had the chance to walk through the rooms used to greet dignitaries and sign bills/make speeches in front of the cameras. Chile used to officially be Catholic, so there is a chapel inside the palace. That has changed over the years, and now many religions worship there. And of course, at the entrances, the guards are snappily dressed and happy to take a moment to pose for pictures. One of the most important museums in Santiago is the Museo de la Memoria y los Derechos Humanos. It commemorates the victims who were disappeared, tortured, murdered, and imprisoned during the Pinochet government as well as the dictatorship’s eventual downfall. Abuses began the day Pinochet came to power, and thousands suffered terrible fates during the following 17 years. Many remains are still being found and identified today. Ongoing resistance by the public and by church leaders eventually helped to bring about the regime’s dissolution. In 1988 a plebiscite vote about letting Pinochet begin another 8-year term. The resulting ‘no’ led the way for open elections in 1989. The TV ads but together by both sides are wonderfully ’80s. My new proposal: all parties in an election should have hilarious ads and musical numbers at their disposal. And of course, there is an added level of absurdity about voting to keep (or not) a dictatorial regime in place. It is one of the few awful eras in world history ended by a peaceful vote and happy campaign buttons. In a park next to the Museo de la Memoria is the Natural History Museum. We arrived about half an hour before closing. That gave us just enough time to walk through the exhibits, which are mostly about the different ecological zones of Chile. I finally got some help to explain the differences between all the alpaca-y animals – there are four species! Not all look as surprised to be a part of the museum as the one in the picture.